Over 80 people are reported dead after attacks in Charsadda, North-West Pakistan. 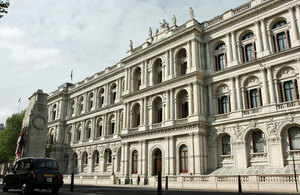 Foreign Secretary William Hague has condemned the attacks describing them as "cowardly". “I condemn this morning’s attacks in Charsadda, North-West Pakistan that have claimed over 80 lives and injured many more. These attacks were cowardly and indiscriminate, killing many innocent bystanders and targeting those who serve to protect Pakistan. They prove once again that such extremist groups have no regard for the value of human life. “I offer my sincere condolences, in particular to the families of those whose lives were lost and to those who were injured.